At the time, Perich was a recent transplant to New York City from France who occasionally worked at Max’s as a busboy. Perich, an artist, would document the goings-on at Max’s in Super 8 film and photographs. He tells the journal that the films he shot at Max’s were screened on the 17th and that the people in the films were also in the audience watching, people such as Jack Smith, Francis Francine, Candy Darling, Ruby R., Mary Woronow, Tiger Morse, and Taylor Mead. You can watch segments of Perich’s Super 8 films in the Journal’s Forum. 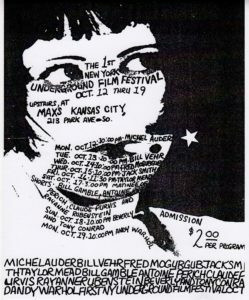 Some of the filmmakers who screened work are very familiar names in the underground film world, such as Jack Smith, Andy Warhol, Taylor Mead, and Beverly and Tony Conrad. Other names — such as Bill Vehr, Fred Mogubgub, and Michel Auder — may be less well-known in the underground “canon” of the ’60s and ’70s, but have had significant film, art, and/or video careers. Perich would go on to become a raucous figure in the NYC public access TV scene and invent a precursor to the inkjet printer. By 1970, Jack Smith had begun retreating from making official “films” and was officially soured by the whole controversy surrounding his 1963 epic Flaming Creatures, so it’s unknown what films he would have preferred showing in 1970, although he did complete Song for Rent in 1969. As far as the Journal knows, Taylor Mead never made his own films, so he must have screened work that he acted in, such as the films by Ron Rice, who had passed away in 1964. Mead also appeared in numerous Andy Warhol films. Warhol had pretty much given up directing movies himself and didn’t seem much interested in screening them anymore, so what he would have presented in 1970 is also curious. Experimental filmmaker Tony Conrad collaborated on two films with his wife Beverly that were widely screened in 1970: Coming Attractions and Straight and Narrow, both of which may have been screened at NYUFF ’70. Bill Vehr, mostly known for his stage acting career, had made a popular underground film called Avocada and others all starring drag performer Mario Montez. Fred Mogubgub was a painter who also made short films combining live action and animation, such as The Pop Show (1966), which starred a young Gloria Steinem. Lastly, the Journal has discovered that the NYUFF ’70 was promoted in the Village Voice. 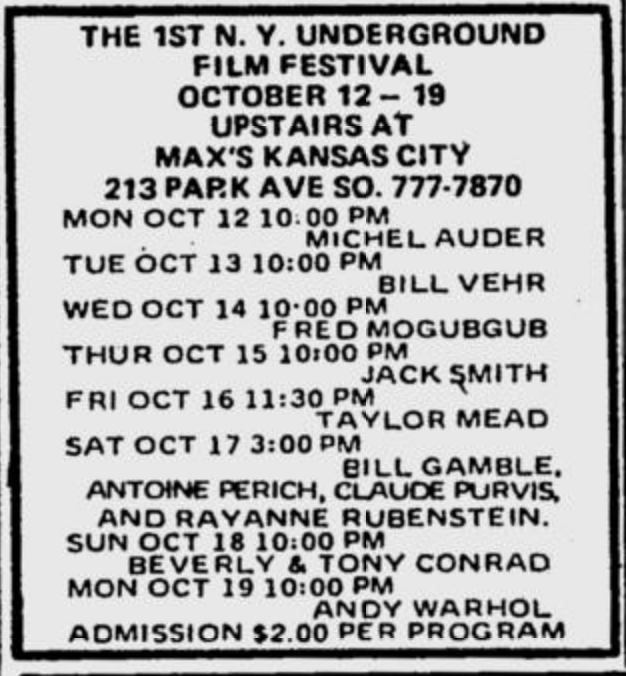 A small ad in the October 9 edition of the voice matches the screening lineup in Perich’s poster. Plus, screenings would continue into November, according to additional Voice ads. 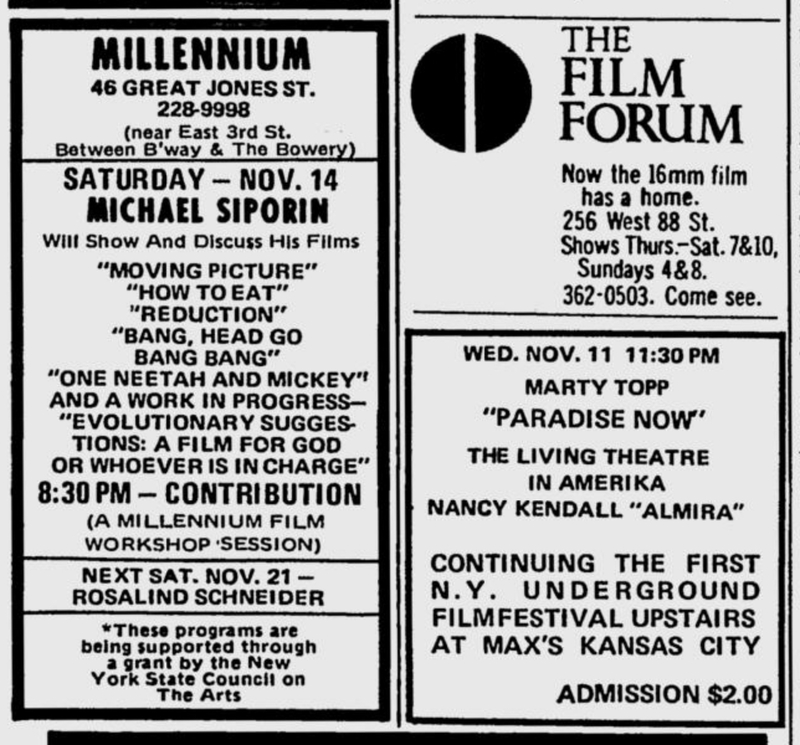 Perich’s films would screen again on November 18, according to a November 19 ad; while other films screened the week before. It is not clear in an ad in the November 12 Voice if films from the official festival screened on November 11, or if it was considering new films — Marty Topp’s Paradise Now and Nancy Kendall’s Almira — as continuing the festival. The NYUFF ’70 lineup is typed out below; while below that you can look at the Voice ads the Journal has uncovered.